Here we present some of the pictures from a recent book which is a collection of some of the account's best images. 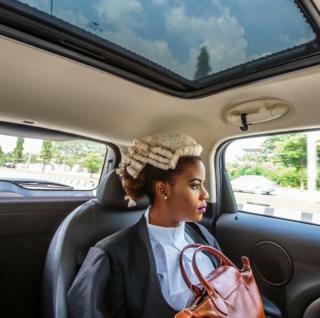 Nigerian photographer Tom Saater captured the feeling of hope and anxiety in the face of lawyer Ginika Okafor who had just been called to the bar. She was on her way to the graduation ceremony in Nigeria's capital, Abuja, when she was photographed in this thoughtful pose. Saater says this was a very emotional day for Ginika. She had been crying shortly before the picture was taken and had been talking a lot about what her life would be like after graduation, he adds. Ricci Shyrock took this photo of a man trying to look sharp despite the dusty street around him in Guinea's capital, Conakry, just before the country was declared Ebola-free. 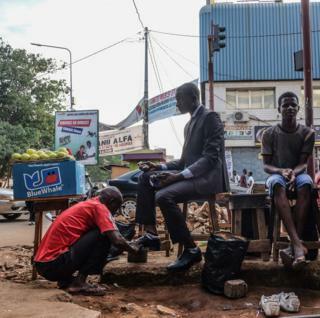 "There was something I relished about seeing such a mundane activity as shoe shining going on normally as the fear of Ebola faded," she says. "In addition, I'm often drawn to reflections of fashion in the street and what those fashions say about a society. "I've always seen shoe shining as such an aesthetically obvious way fashion is also a class divide. I wanted to show that class divides exist here just as obviously as they might in somewhere more familiar to the global gaze, such as New York." 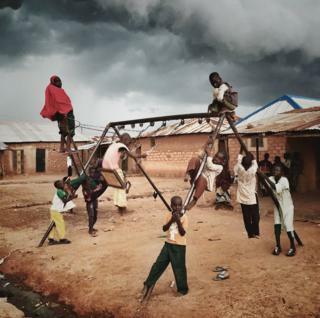 Malin Fezehai captured these children at play near Zaria, northern Nigeria. "I really like the boy in the middle who is looking at something and zoning out from everything happening around him," she says. "Then you also have a storm coming in the background so the clouds are very dramatic, and I think it's just a nice playground moment that I reacted to." 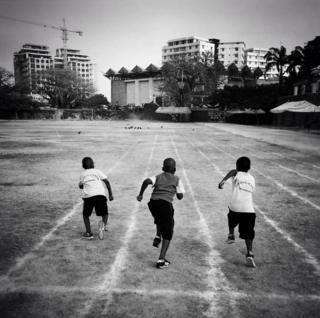 Austin Merrill caught children at play on the other side of the continent, at a school in Mombasa, Kenya. "I feel like the image has something to say about the future for these kids," he says. "They're sprinting toward something that's unknown but hopeful. The crows on the track might be seen as a portend of something negative, but they're overwhelmed in the photo by the buildings - modern structures and a construction crane that speak to opportunity and promise." Edward Echwalu captured a young boxer during a training session in a makeshift gym in the Katanga slum of the Ugandan capital, Kampala. The gym is known as a place where young mothers go to box. Initially this was for self-defence, but some women have gone on to earn money from the sport. 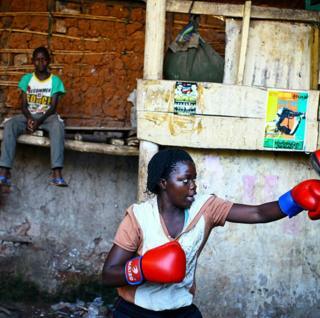 "Boxing is seen as a man's sport and these women are breaking the stereotype," Echwalu says. "To me, the boy in the picture is learning that boxing is not the preserve of men." 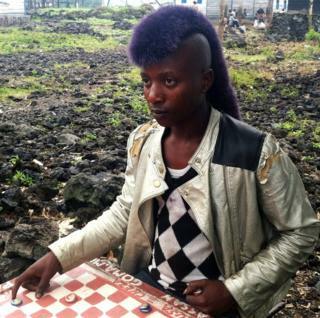 The metallic jacket and hair-do of this young refugee in Mugunga, eastern Democratic Republic of Congo, playing draughts caught the eye of photographer Ley Uwera. "I was impressed by the hairstyle, the look and attention to detail," she says. "The photograph shows that everyone can live a normal life. It also shows something positive about a situation that is not so wonderful." "Being nervous about taking a test is, I believe, something universal for those who have had the privilege of being a student," photographer Jana Asenbrennerova says. 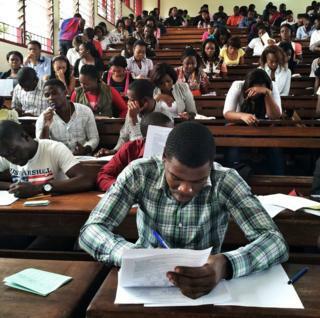 She snapped these students at the Université Protestante in Kinshasa, capital of the Democratic Republic of Congo, as they were taking their final exams. "I visited several classrooms and the atmosphere in each was quite intense... I easily related to their anxiety and felt their pain of exam taking," she says. The Instagram format means that the mobile phone plays a central, if unspoken, role in Everyday Africa. Here, in Andrew Esiebo's shot, that comes to the fore. 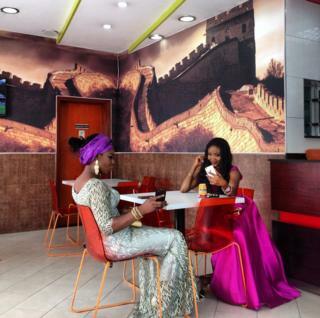 These two glamorous women in a Lagos cafe are taking and comparing selfies as they prepare for a night out. Part of Esiebo's work is chronicling the rapid development of urban Nigeria and capturing the people in the cities. "I took this photo on a hot summer afternoon during the final weekend of a month-long traditional celebration in the Cape Flats here in Cape Town," Charlie Shoemaker says. 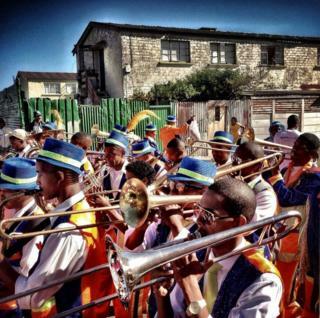 "With streets lined with bystanders yelling and dancing, the band snaked through the winding road of the township." But the photo also shows a moment of joy before a tragedy, Shoemaker says. "The events later in this day would take me from this beautiful scene to absolute horror as a young member of the band was killed as an innocent bystander to a gang fight." Portraiture is a familiar format where the pride of the subjects can often shine through. Photographer Holly Pickett says she was wrapping up an assignment in the southern Senegalese village of Sare Dembara when she decided to snap some of the villagers. 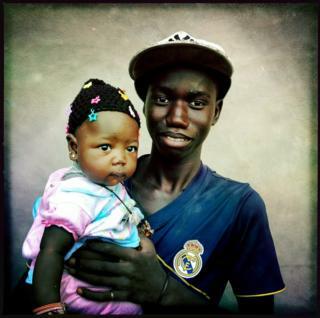 "The young man in this photo quickly picked up his daughter before presenting himself to me. "He was so proud. He wanted to be photographed while holding her, and it was a spontaneous, sweet gesture of affection. A parent's love is universal." 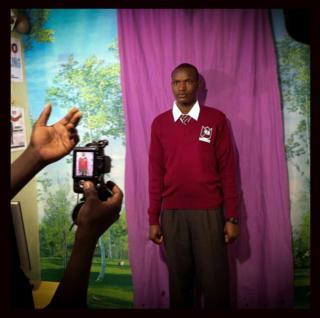 Nichole Sobecki was drawn to this photographer's studio in Kibera, the large slum in Kenya's capital, Nairobi, as its lights were shining out in the early morning. The boy was having his photo taken for an ID card. "The student had the look of intentional seriousness that many of us take up for official portraits," she says. "As soon as the camera was away he relaxed, laughing with us as we waited for his photo to be printed and the long walk ahead of him to school." Sobecki is a photojournalist taking pictures to communicate a specific story, but she says she also likes to capture "the quirks, jokes, boredom, frustration and hope that make up this diverse and changing continent". Laura el-Tantawy says her photograph "is a slice of the vibrant life and energy overflowing on Cairo's streets". 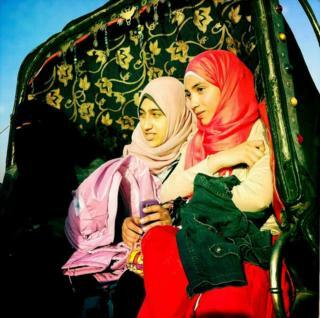 She snapped the women riding in a horse carriage close to Tahrir Square from her car window. "My first instinct was to photograph the rainbow of colours," she says. "The women's hijabs contrasted against the colours of the design inside the carriage. "I never saw the woman in the niqab and even now, when I look at the photograph, my eyes often miss her and go to the two girls on the right. Her presence is a surprise for me." In Mali's capital, Bamako, in November 2015, while attention was focused on the aftermath of an Islamist militant attack on a hotel, life carried on as normal elsewhere in the city. 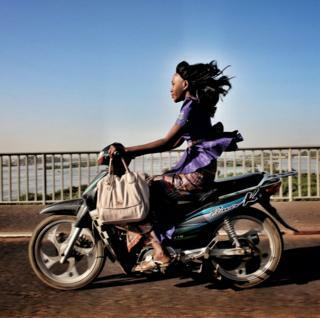 For Jane Hahn, her picture of this woman riding her motorbike with the wind blowing through her hair, "represents the resilience, strength and beauty of the Malian people".